All old urls should continue to work - if you find some broken let us know! See more about this new site at our first new entry. On behalf of the JBoss Tools and Developer Studio team, I am extremely proud to announce the general availability of the JBoss Tools 4.1.2.Final and Red Hat JBoss Developer Studio 7.1.1.GA releases. Red Hat JBoss Developer Studio is a fully bundled Eclipse distribution which not only includes the majority of JBoss Tools but also all its needed dependencies and 3rd party plugins allowing for an easy one-click and no-fuss installation. If you are into doing your own bleeding edge Eclipse plugin assembly, JBoss Tools is for you; if you are more into having something that "Just Works" then JBoss Developer Studio is the way to go. If you already have JBoss Tools 4.1.1 or Developer Studio 7.1 installed using 'Help > Update' will give you this release automatically. If you want a new installation, then JBoss Developer Studio is available as a one-download-installer with everything bundled and configured out of the box. 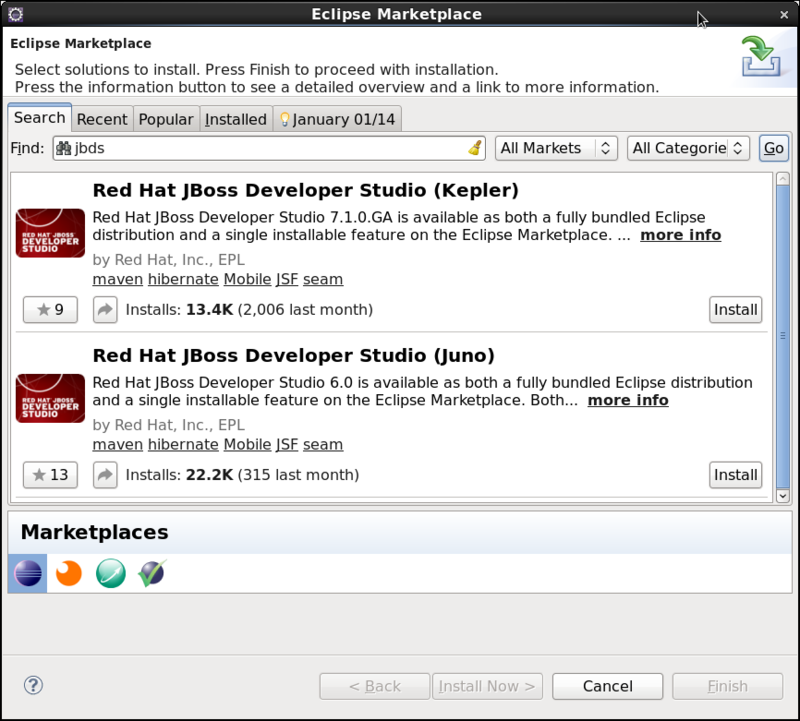 You can also install JBoss Developer Studio or JBoss Tools from Eclipse Marketplace via "Help > Eclipse Marketplace..."
When installing from Eclipse Marketplace we recommend using a fresh Eclipse 4.3.2 JEE Bundle since then you'll have most of the dependencies pre-installed. JBoss Tools 4.1.2 and JBDS 7.1.1 are primarily focused on building on top of the latest Eclipse Kepler SR2 release, fixing 30 issues along. We keep on trying to make the life of Angular JS users easier, as you can see below. This is the last planned release of the JBoss Tools 4.1.x and JBDS 7.1.x streams, based on Eclipse 4.3.x. Cool kids already play with the next milestones for Luna. We backported one of the features we contributed to Eclipse Luna (Milestone 6), that is the ability to ignore non-standard HTML attributes. This is typically needed when developing Angular JS applications as the HTML validator considers Angular JS ng-* attributes as invalid html (which is actually correct since the proper syntax to be 100% compatible with the html5 spec is to use data-ng-*). 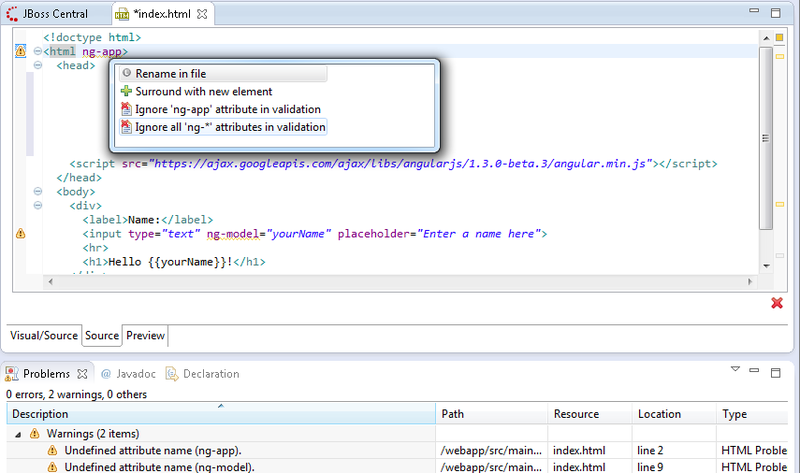 And if you're really into Angular JS, we recommend you try the AngularJS Eclipse plugin. We're currently evaluating it ourselves for inclusion in the next major version of JBoss Tools and Developer Studio. Please don't hesitate to use our forum to ask questions, or, if you have ideas to better improve JBoss Tools / Developer Studio, or found a bug, then open an issue in our issue tracker. When we started working on the Hybrid Mobile (Cordova) tools about a year ago, we predicted that there is a need for a good, open source IDE for developing Cordova based mobile applications. After our initial releases, we started to see the interest to use, build on and contribute to the project. With this interest, the next logical step for us was to take Hybrid Mobile tools to Eclipse Foundation to form an even greater community. Last week, We have put the Thym (The HYbrid Mobile) project proposal online. Please take a moment to look at the proposal. At this stage, we are collecting the interested parties for the project. If this is a topic of interest for you or your organization or you simply have questions, please let me or the community at large know. Being an interested party on an Eclipse proposal means this is a project that is interesting for you and nothing more. 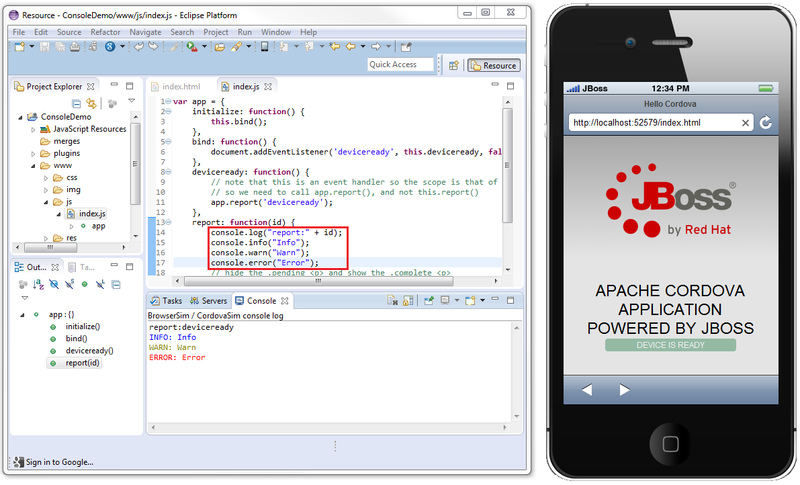 Once the Thym project is established our activities around mobile will NOT cease to exist on JBoss.org. Our plan is to utilize the Thym project and continue building tools that will make mobile development easier by utilizing projects and technologies such as Aerogear, Openshift etc. Exciting times are ahead for mobile developers. If you are planning to attend EclipseCon, I will be having a session around Hybrid Mobile Tools. Also, do not miss the other Red Hat sessions. 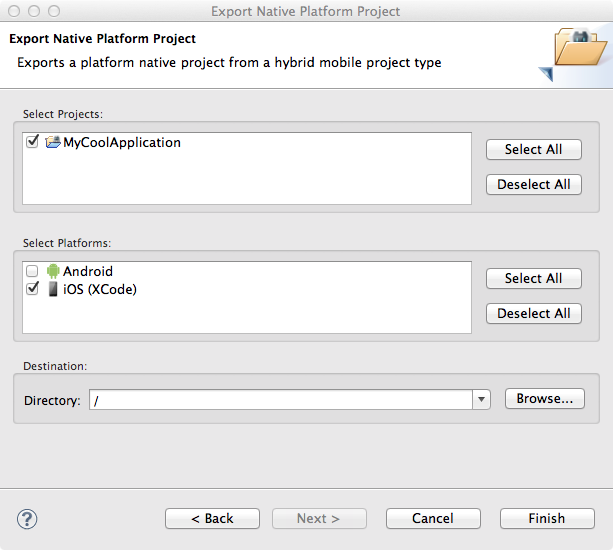 One question (and complaint) that has been raised after the release of multiple cargo version support is "How to use custom Cordova engines together with JBoss Hybrid Mobile tools?" Well, we heard you and we are already on it. In the next release, JBoss Tools 4.2.0 Beta 1, we are adding the ability to search Cordova engines from local directories and use them. Here is a video showing how this works, which is still subject to changes of course. There are some caveats with this feature though. Unfortunately, we are not able to use "any" Cordova based distribution. In this release, tools are only able to recognize Cordova compatible directory structures. For instance, we rely on files such as VERSION, that is found on Cordova distributions, to recognize Cordova versions. However, If you have a Cordova based distribution that has a significantly different layout, it will be possible to introduce them through an Eclipse extension point. If you're interested in such an extension point, I would be happy to hear about your requirements. If you wish to try it out, this feature is already part of nightly builds and you can get the information on nightly update site from jbostools-aerogear project site. I recommend updating the 4.2.0 Alpha2 with the nightly update site for best experience. Its time to start the milestones counting up to the next Eclipse release train this summer. Here is the first tested to work Alpha release targeting Eclipse Luna (Eclipse 4.3) M5. This release is targeting Eclipse 4.4 M5 (Luna). 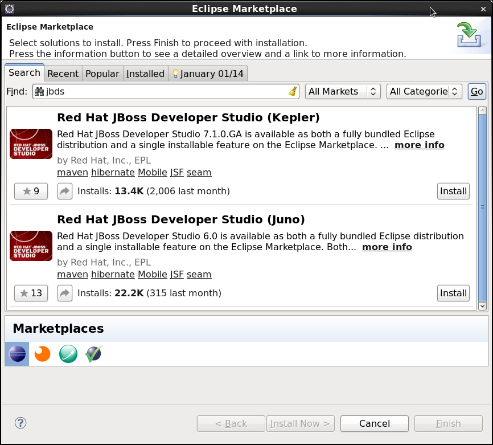 Best approach is to download and install Eclipse JEE M5 Bundle and use this updatesite: http://download.jboss.org/jbosstools/updates/development/luna/ to install JBoss Tools from. This release targets Eclipse Luna M5 giving you the latest fixes/improvements from eclipse.org plus a bunch of new features/improvements we have been working on. ability to upgrade easily to new versions or stay at the version of Cordova they were targeting. In this version we are introducing multiple cordova runtime support allowing you to use any Cordova 3.x version. The arquillian tooling received a good round of bug fixes including more control over the enablement of Arquillian on your project. 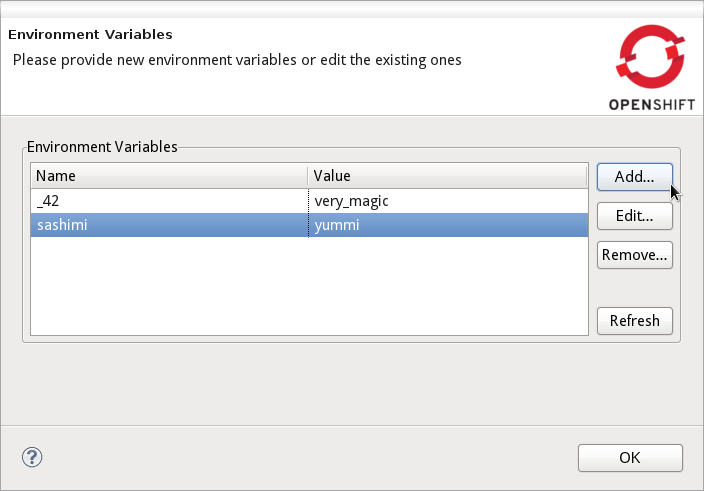 There are also improvements to various wizards, validation and overall speed of Arquillian tooling. This alpha2 introduces a lot of internal changes to the server tools implementation. support managed deployments and allow for 100% remote servers (i.e. not require a local runtime). to add more extensions and better workflows more easily than what we could in past. and keep eyes on our nightly builds to see the benefits of this rewrite/refactoring. 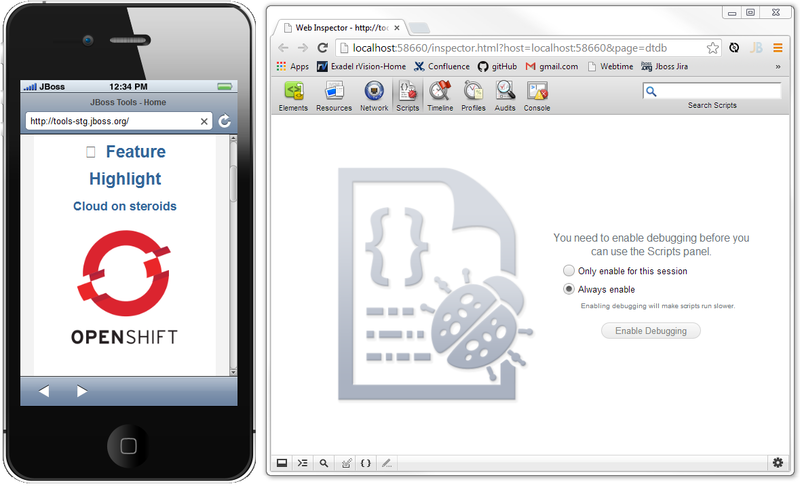 you to do "chrome dev-tools" style debugging and inspection of your applications. Please be aware that this requires an Oracle JVM and currently only works reliably on Windows and OS X. Both JQuery 1.3 and 1.4 is now supported in the palette. 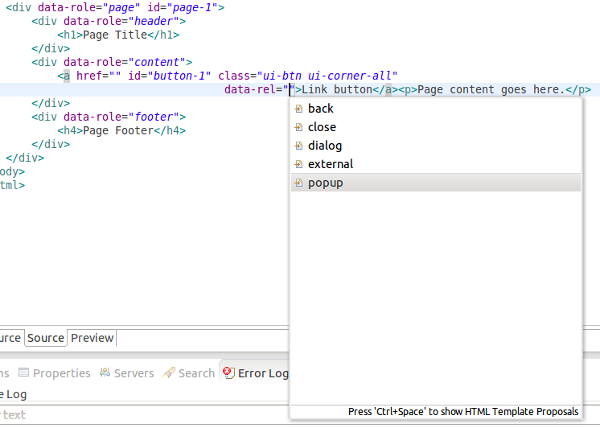 And we now also load remote .css files to provide class style content assist. 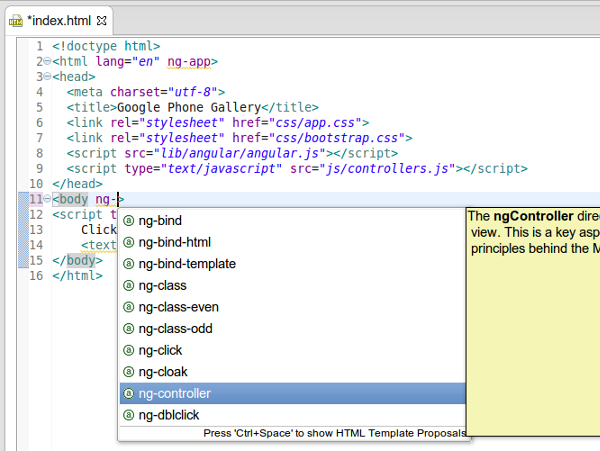 To aid in developing of Angular JS applications we've added content assist for ng-* attributes. A very common complaint of Angular JS users are that Eclipse (and other IDE's) mark 'ng-*' attributes like 'ng-data' as validation errors. point when most projects uses what is recommended by AngularJS project. Note: This feature is actually part of Eclipse Luna WTP, but worth mentioning since we contributed it as part of our Alpha1/Alpha2 development. 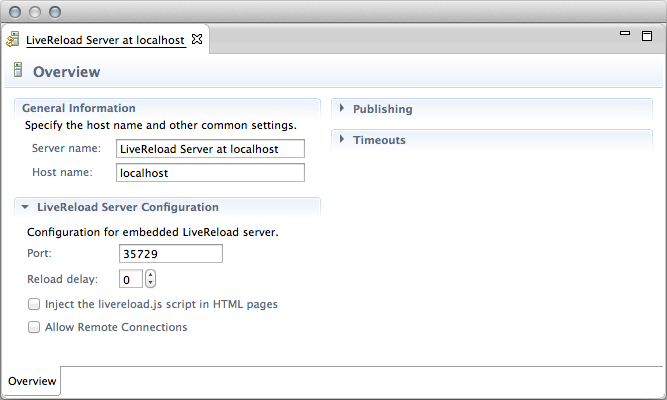 LiveReload now has an option to delay the refresh of the browser. of it not doing instant reload sometimes takes a few seconds to discover the changes to your html pages. With this reload delay you can avoid having to manually click Refresh. Until now OpenShift tooling was actually ignoring if your server had an invalid or untrusted SSL certificate. Wait - where is Alpha1 ? You might have noticed this is Alpha2 and not Alpha1. We actually built and released Alpha1 in late December but because of a lot of SWT vs GTK3 vs XULRunner vs WebKit incompatibilities (aka. hard crashes) with Luna M4. The Stack Is Really Back! BPEL/Riftsaw - A Web Service Business Process Execution Language engine used to describe high level business processes and orchestration. BPMN2 - A graphical modeling tool which allows creation and editing of Business Process Modeling Notation diagrams using graphiti. Drools/jBPM6 - A Business Logic integration Platform which provides a unified and integrated platform for Rules, Workflow and Event Processing. Drools/Guvnor - A centralized repository for Drools Knowledge Bases, with rich web based GUIs, editors, and tools to aid in the management of large numbers of rules. JBoss ESB - An enterprise service bus for connecting enterprise applications and services. Fuse Tooling - A graphical tool for integrating software components that works with Apache ServiceMix, Apache ActiveMQ, Apache Camel and the FuseSource distributions. ** Note: Fuse Tooling is currently at version 7.2.0.CR2 - not at .Final. jBPM3 A flexible Business Process Management (BPM) Suite - JBoss Enterprise SOA Platform 5.3.x compatible version. Modeshape - A distributed, hierarchical, transactional and consistent data store with support for queries, full-text search, events, versioning, references, and flexible and dynamic schemas. It is very fast, highly available, extremely scalable, and it is 100% open source. Savara (JBoss Tools only) - A tool for ensuring artifacts defined at different stages of the software development lifecycle are valid against each other, and remain valid through the evolution of the system. SwitchYard - A lightweight service delivery framework providing full lifecycle support for developing, deploying, and managing service-oriented applications. All of these components have been verified to work with the same dependencies as JBoss Tools 4.1 and Developer Studio 7, so installation is easy. Either way will give you the final release of the tools. Besides the great news of now having updated support for the previously available SOA Tooling, this release also brings two new components to the stack: Tooling for SwitchYard and Fuse. SwitchYard is the replacement for JBoss ESB and is a component-based development framework focused on building structured, maintainable services and applications using the concepts and best practices of SOA. The tooling provides wizard for setting up maven based SwitchYard projects, Configuration of SwitchYard capabilities (i.e. runtime component dependencies; e.g. SOAP, BPM, Apache Camel, etc. ), graphical editor for switchyard.xml and more. Fuse comes with tooling that enables you to work with Fuse and Apache versions of ActiveMQ, Camel, CXF, Karaf, and ServiceMix. You can connect and configure Enterprise Integration Patterns to build routes, browse endpoints and routes, drag and drop messages onto running routes, trace message flows, edit running routes, browse and visualize runtime processes via JMX, and deploy your project's code to Red Hat JBoss Fuse and Fuse Fabric containers, to Apache ServiceMix, and to Apache Karaf. There has also been significant development in Drools/JBPM and Teiid Designer. The Drools/jBPM6 plugins have been updated to support the 6.0 version of both projects. The wizards have been updated to the new API and there is support for Drools6 and jBPM6 runtime libraries. The jBPM plugin now also uses the new Eclipse BPMN2 Modeler project for editing processes using the BPMN 2.0 XML format. This editor does support the full BPMN 2.0 specification, and the jBPM profile now supports many new building blocks and properties to use when creating your business processes. The Teiid Designer 8.3 release provides additional JBoss Tools server integration as well as numerous bug fixes and a few enhancements. Lots of new toys - tell us what you think and what new tooling you'd like to see! In the future we will add more features and fix more bugs. Just as important though is that in the past JSDT was seen as a complex project to contribute too, and suffered from several pitfalls making contributors less productive than they could be. With the help of various people related to JSDT or WTP project, we improved a range of issues making contribution easier. There is now a single Git repository to contribute to JSDT. There used to be 3 of them, which scattered the project, made it more difficult to keep things synchronized, and to build all JSDT at once. We used Jenkins Gerrit plugin to incoming have Gerrit contributions automatically built and tested, and have Hudson voting on a patch to tell whether it contains a visible regression or not. This either gives more credit to your contribution, or it gives faster feedback if it breaks something. Also, it was easy to create a job with Hudson which generates SonarQube reports. Those reports are quite interesting since they already detected many hotspots where there are very probably bugs and code that has bad performance impact. As you can see, many improvements have been made to make it easy to contribute to JSDT and to give it the necessary infrastructure to increase its quality and agility. You're now very WELCOME to join JSDT and contribute to its evolution. If you want to get started now, the "Clean code" issue is a good starting point and help is very welcome there. First of all, since it is the period for this, I want to wish everybody a happy and productive new year! Just before the end of the year, the JBoss Tools team have released version 4.1.1 of JBoss Tools and version 7.1 of JBoss Developer Studio. As described in the release blog post there are a lot of interesting improvements and cool new features available. In this post, I want to focus on something that didn't get a lot of attention yet: the availability of Forge 2. As some of you know, Forge is a rapid application development tool that enables you to quickly create new projects (or use existing ones) and enhance them with support for a wide variety of Java frameworks or tools. You can even add support for your own framework or make tedious work simpler by creating your own extensions for Forge. The support for Forge 1 has been included in JBoss Tools for about 2 years now. It's use has been described in one or two of my earlier posts. The fact that not a lot of people know that Forge 2 support has also been around for more than half a year is because it was in fact still pretty much under construction. But the 4.1.1 release of JBoss Tools includes Forge 2.0.0.Beta3 and it is about time that people start to be aware of its possibilities. The installation of Forge 2 is pretty much like it was before. 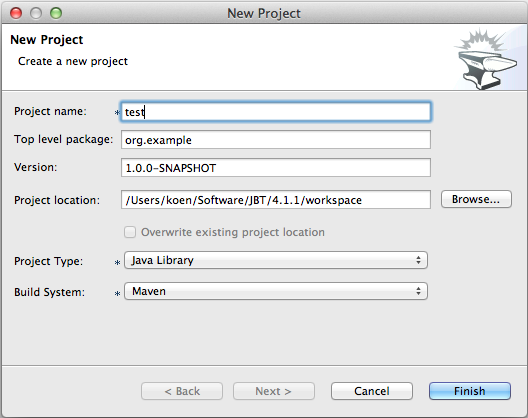 From a fresh install of the Kepler SR1 release of the Eclipse IDE for Java EE Developers, you select 'Help->Install New Software'. In the subsequent dialog you enter the URL of the JBoss Tools Kepler update site: http://download.jboss.org/jbosstools/updates/stable/kepler/. In the filter text you type 'Forge' and then push 'Select All' to select all the remaining items in the table. The process is illustrated in the screenshot below. You can see that the Forge 2 support is still listed as experimental. This qualification is supposed to disappear soon as Forge 2 is heading towards a Final release. 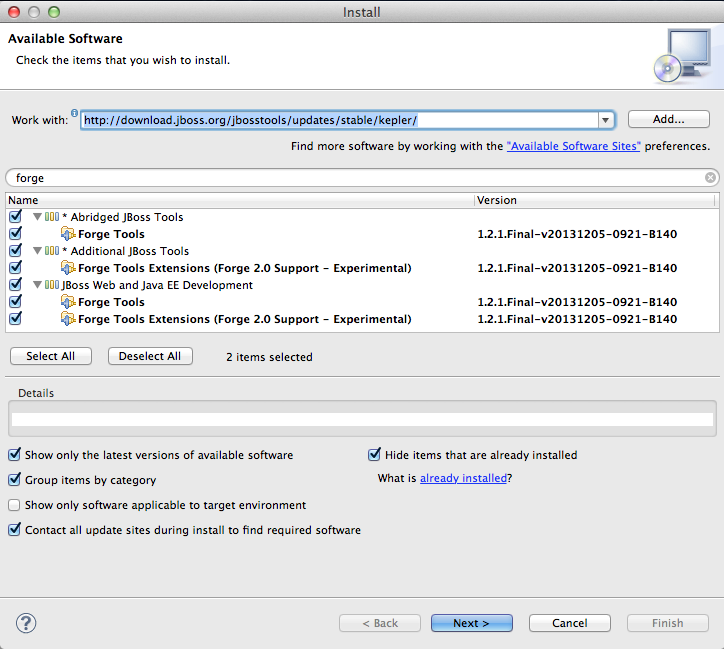 Also, note that the installation of the Forge Tools is needed to install the Forge Tools Extensions. The rest of the installation process is pretty straightforward: you push the 'Next' button twice, accept the license agreements and push 'Finish'. After the installation is finished you will need to restart Eclipse. When Eclipse is restarted you are able to also start Forge 2. Currently the preferred way to do this is to use the CTRL + 5 (or CMD + 5 on a Mac) key combination. 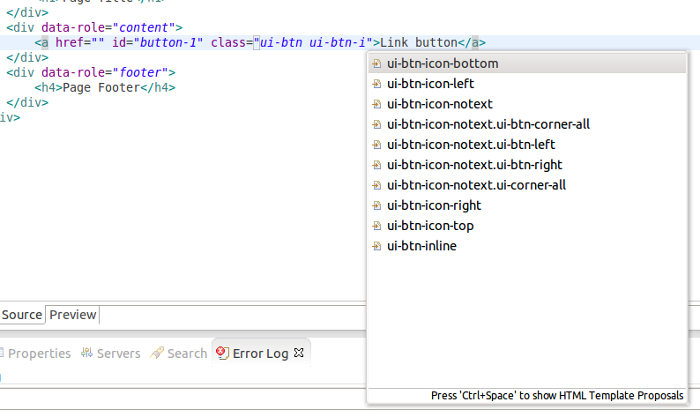 You can change the combination by bringing up the Eclipse preferences and navigating to 'General->Keys'. In the screenshot below you can see what this looks like on my machine. 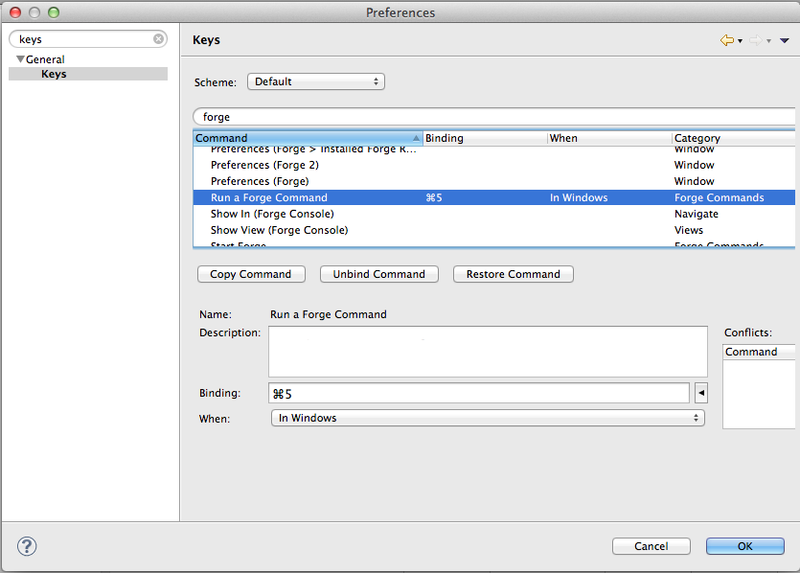 Using the selected key combination for the first time will automatically start Forge 2. A popup that informs you about this will be shown. When the popup disappears a new popup takes its place. This new popup contains all the Forge 2 commands that are available in the context of the currently selected item in your workbench. You are now ready to start using Forge 2. Forge 2 has introduced a drastic change with respect to its older sibling. The preferred way to issue Forge 2 commands from within the JBoss Tools platform is now not longer to type them at a command prompt but to bring up a Forge wizard. To bring up the list of available wizards, just like when you were starting up Forge 2, issue the CTRL + 5 key combination. When Forge 2 is already started it will immediately show the popup of the available commands. As an example, let us select the 'New Project' command. The Forge 2 wizard for creating new projects will start. I have chosen the name 'test' and kept all the defaults in the wizard page. If you hit 'Finish' the project will be created at the specified location and imported into your Eclipse workspace. If now, while having e.g. 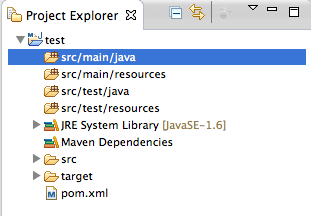 the src/main/java folder selected, you hit CTRL + 5 again, you will see that a vast number of new commands are appearing. Indeed, these commands are as I already mentioned earlier, depending on the currently selected item in your workspace. So within the context of a project you can do all kinds of other things like setting up support for one or more of the Java EE specs. This list can become very long so it's interesting to know that you can narrow it down by typing a search string in the text field at the top of the list. It's out of the scope of this blog post to explain each of these possible choices in detail but stay tuned because these will be explained in detail in more posts to come and of course in our documentation. While Forge 2 is supported on the command-line, the integration of it in JBoss Tools was not yet completely finished when 4.1.1 was released so you'll have to stick to the wizards for now. 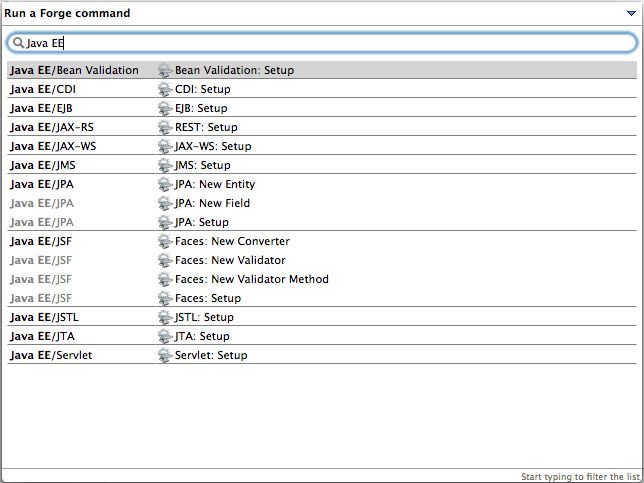 However, if you are really curious and want to test it out already now, you should try the JBoss Tools 4.2.x builds. In the immediate future you can also expect the release of Forge 2.0.0.Final. We invite you cordially to try out this new version of our beloved tool whether included in JBoss Tools or at the command-line and provide us with all the feedback (good or bad) that you think might help us to make it even better. In the meantime: happy Forging! On behalf of the JBoss Tools and Developer Studio team, We are extremely proud to announce the general availability of the JBoss Tools 4.1.1.Final and Red Hat JBoss Developer Studio 7.1.0.GA releases. If you already have JBoss Tools 4.1 or Developer Studio 7.0 installed using 'Help > Update' will give you this release automatically. If you want a new installation then, JBoss Developer Studio is available with a one-download-installer with everything bundled and configured out of the box. When installing from Eclipse Marketplace we recommend using a fresh Eclipse 4.3.1 JEE Bundle since then you'll have most of the dependencies pre-installed. JBoss Tools 4.1.1 and JBDS 7.1 are built on top of Eclipse Kepler SR1 (4.3.1) and are primarily focused on improving stability (more than 500 issues were fixed). Don't worry, we also added a bunch of new cool features, so make sure to read the complete New and Noteworthy for a detailed and complete overview. 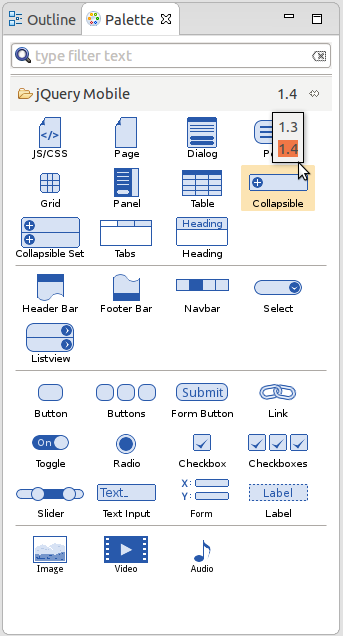 There are now content assist on resources for things like script, img, source, anchors etc. Alexey made a nice video of how it works you can watch here. Furthermore if you type in a resource that does not exist the html editing tools now offer to create the resource for you, making it much easier to quickly create a set of linked resources. Another recurrent complaint is that the HTML validation considers Angular JS ng-* attributes as invalid html. This is actually correct since the proper syntax to be 100% compatible with the html5 spec is to use data-ng-* and if you disabled this rule you would loose warnings against you misspelling i.e. class as clas. This issue we can't fix in JBoss Tools alone thus we have submitted patches upstream to eclipse to allow you to choose to ignore ng-* and any other combination of attributes in your specific project. You can follow that here if you are interested. Recent updates to OpenShift online and OpenShift Enterprise introduced the notion of user accounts having access to multiple domains. This is very useful if you are working together in a team and want to share access to your various applications. 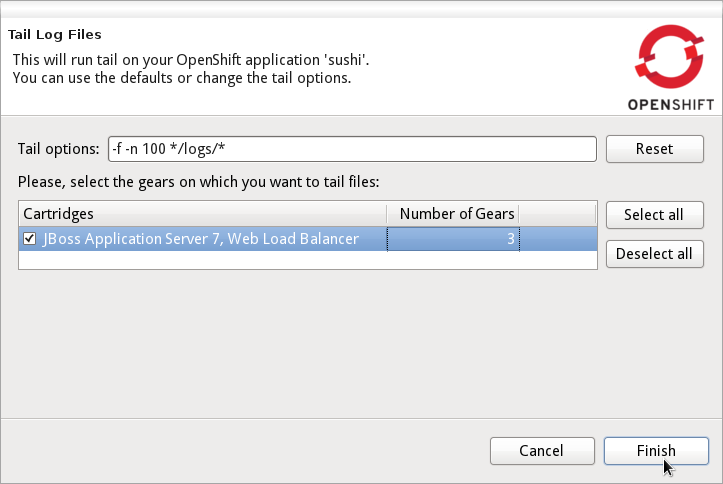 The OpenShift tooling now fully supports multiple domains in the UI. These domains will show up in application creation and editing wizards and as shown below in the OpenShift Explorer. Once we recover from all the end-of-year festivities, we'll resume our work on the next generation of JBoss Tools and Developer Studio, for Eclipse Luna. We are getting closer to the final release - give this candidate release a spin. JBoss Tools is a set of plugins for Eclipse that complements, enhances and goes beyond the support that exists for JBoss and related technologies in the default Eclipse distribution. 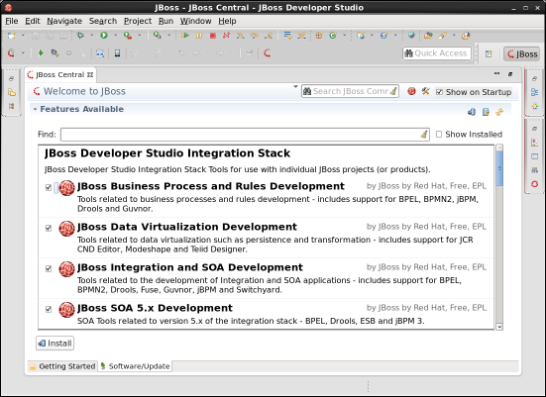 JBoss Developer Studio is a subset of JBoss Tools including a full Eclipse and other 3rd party plugins. 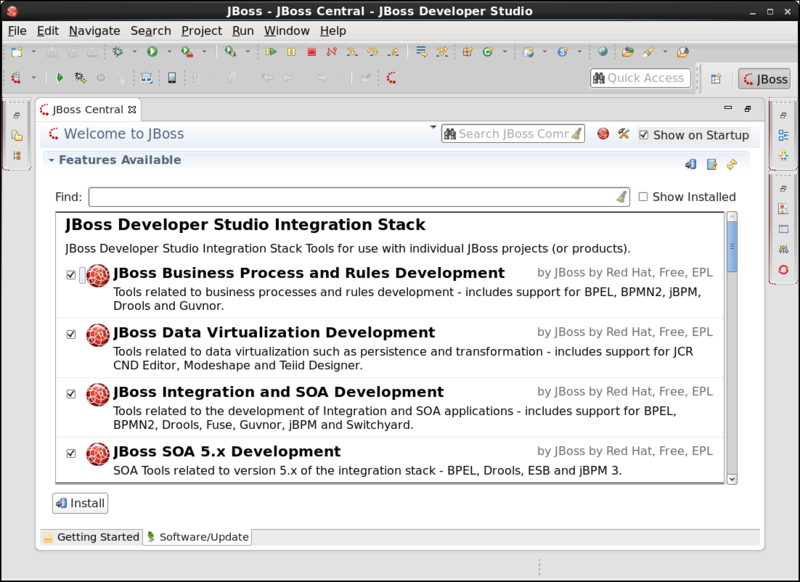 You can download JBoss Developer Studio from our Early Access site. Use this if you just want an easy to install, but fully bundled Eclipse installation. Note, if you already have this enabled you will get updates to your plugins via 'Help > Check for updates' but you will not get new plugins installed - thus if you don't have Cordova tooling installed already you need to use the 'Help > Install' menu to install it. There are more news and screenshots in What's New, and if you have an idea to an improvement or found a bug do not hesitate to open an issue in our issue tracker. ...and do not forget that Integration Stack is Back, giving you support for SOA related tech too - we got beta builds for that too here. Just in time for Devoxx I'm proud to announce another great Beta! This update makes us feature complete for 4.1.1 release which incl. improvements to html5 editing, testing, Apache Cordova 3 support and big updates for OpenShift. For this Beta the Cordova Tooling is a separate install. In the future you will be able to install it directly from JBoss Central. 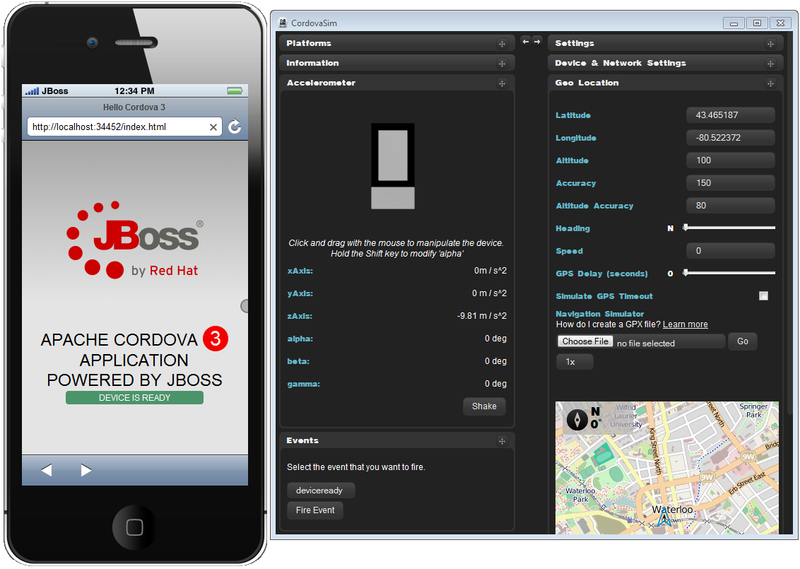 The Aerogear Hybrid tools and CordovaSim is now targeting Cordova 3. With Cordova 3 (almost) everything is a plugin, allowing you to just install/use the plugins you want for your application. The Aerogear Hybrid tools now support these allowing you to install and remove plugins from a Hybrid project. The Aerogear Hybrid tools now has a wizard for creating binaries for your favorite platform (currently we support Android and iOS). This allows you to deploy your application to a native device. Furthermore you can now also export your hybrid project in source form for further editing as an Android (ADT project) or iOS (XCode). 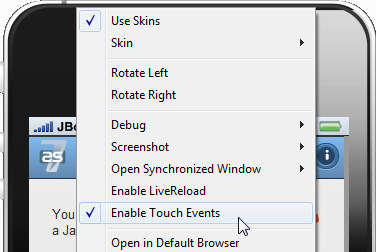 only react to touch as opposed to traditional mouse/click/drag events. Recent updates to OpenShift introduced the notion of user accounts having access to multiple domains. This is very useful if you are working together in a team and want to share access to your various applications. Environment variables for OpenShift applications allow to you to refer to variables in applications instead of hardcoded values - allowing for better reuse and setup flexibility for your application. OpenShift tools now allow you to specify the environment variables when creating applications and editing environment variables for existing applications (Note: depending on your application you might need to restart to see the effect of these edits). which we introduced in a previous Alpha. With scaled applications, it can be challenging to monitor the multiple gears that can be running in parallel. you can toggle between or simply close everything except that one node you want to track. We plan on moving to Final on the next update which should just include bugfixes. Earlier this month we posted Update to JBoss Tools 4.1 and Developer Studio 7.0 which was done to remedy some of the issues around a regression bug the _40 update to Java caused to Eclipse and hence our tools. Last week Oracle released _45 update for Java 7 which fixes this issue and you should now be able to do updates and installs reliably again in Eclipse based tools. Thanks to Oracle for the quick turnaround! We are cooking on an update to JBoss Tools 4.1. Currently we are preparing for doing some bugfixes incl. 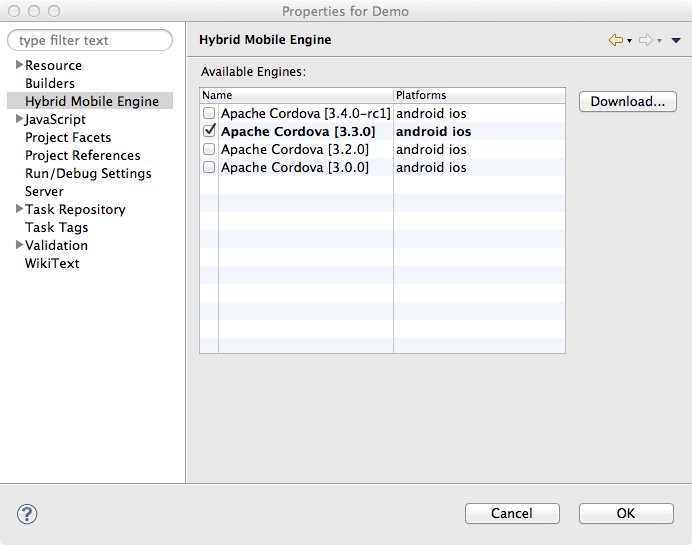 refresh the until now experimental Apache Cordova support as part of our Aerogear Hybrid tooling. Note, if you already have this enabled you will get updates to your plugins via 'Help > Check for updates' but you will not get new plugins installed - thus if you don't have for example the Cordova tooling installed already you need to use the 'Help > Install' menu instead. Alpha2 and the previous Alpha1 build are mainly about bugfixing and being ready to include the Cordova tooling into JBoss Developer Studio. There are though a few new features included to make your life easier. To aid in developing of Angular applications we've added content assist for ng-* attributes. Another often complaint is that the validation of angular.js marks ng-* with warnings as invalid html. This is actually correct since the proper syntax to be 100% compatible with the html5 spec is to use data-ng-* and if you disabled this rule you would loose warnings against you misspelling i.e. class as clas. This issue we can't fix in JBoss Tools alone thus we have submitted patches upstream to eclipse to allow you to choose to ignore ng-* and any other combination of attributes in your specific project. You can follow that here if you are interested. There are more news and screenshots in What's New, and if you got an idea to an improvement or found a bug do not hestiate to open an issue in our issue tracker. Next planned item is beta release which will include improvements to Cordova tooling and introduce it as part of JBoss Developer Studio. gercan already started blogging about some of this at his blog here. ...and do not forget that Integration Stack is Back, giving you support for SOA related tech too - we got beta builds for that announced last week. For a while we have not had a release of the Integration Stack tools for Drools, jbpm, esb, SwitchYard, Teiid etc. that was verified to work with the latest release of JBoss Tools and Red Hat JBoss Developer Studio. Today that is being fixed - at least with a Beta. All of these components are now delivered from an update site that has been tested and verified to work with the same dependencies as JBoss Tools and Developer Studio. Making installing them together easy and smooth. This will give you the beta release of what is going to be part of the supported version of the tools. You can read more about the SwitchYard tooling here. You can read more about the Fuse Tooling here. Thanks to the various component leads to make this happen and especially pleacu , rcernich and nickboldt for making the aggregation happen! Let us know what you think and want next! Oracle introduced a regression bug in their latest _40 release of their Java 7 JDK/JRE which unfortunately prevented installations of plugins from JBoss Central, Maven Connectors, Mylyn Connectors and other Eclipse.org plugins having a installation by discovery feature. To reduce the impact of that we've released an update to JBoss Tools 4.1 and Developer Studio 7.0 that fixes this issue for JBoss Central. JBoss Developer Studio 7.0.1 also provides updates to Kepler SR1 making sure you have the latest bug fixes from eclipse.org too. This fix is available as an update by simply using 'Help > Check for Updates'. Mind you that not all issues caused by Oracle's Java 7 release can be fixed easily thus even with this update we still recommend you use a previous Java version until Oracle releases an update to their JDK that fixes this issue.